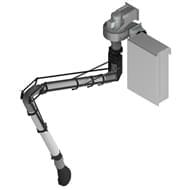 The complete SPARK kit for extracting and filtering welding fumes consists of a fume extracting arm; a wall-mounted fan; a pocket filter for cleaning the air and deodorizing it with active carbon before returning the air to the premises. The SPARK model has a spark arrestor filter; a synthetic prefilter; a main filtering cell and 5 kg of active carbon for removing the unpleasant welding smell from the air discharged into the atmosphere. The SPARK-10 model has a 10 kg active carbon cell instead of the 5 kg cell to comply with the regulations in force in certain regions of Italy. If it is not possible to return the filtered fumes to the premises, the fumes can be conveyed along a vertical exhaust to be fitted to the outlet flange. SPARK is the wall version of the (SMOBI3) the trolley-mounted filter that is the most widely sold filter in the WORKY range.